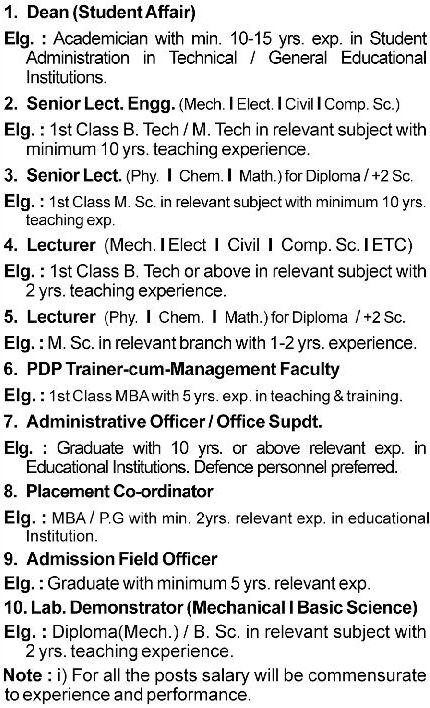 Nilachal Polytechnic, Bhubaneswar has advertised for recruitment of Lecturers / Senior Lecturers Plus Non-Teaching Faculty jobs vacancies. Interested and eligible job aspirants are requested to apply within 07 days from 23rd November 2018. Check out further more details below. About College: ​Nilachal Polytechnic, nestling near the foothills of Sikhar Chandi Temple offers an excellent infrastructure and the best learning ambience in the Temple city. The disciplined and pleasant environment of the campus motivates young aspirant to develop their innovative ideas.The campus is technically focused and is following a structured system academic management. The competitive and resourceful environment promotes the students to perform to the best of their abilities. How to Apply: Interested and eligible candidates are requested to send application along with CV, photocopies of all the certificates / testimonials and recent PP size photos to the email address provided below. Last Date To Apply: Within 07 days from 23rd November 2018.